SR20 Forum > What's New > Technical Information Library > Post Any and All Parts Interchangeability Here! Yes, there are small differences. Some NX have cable driven speedo so obviously the loom does not have a gearbox VSS loom etc. Just a case of patching into the GA16 loom for the wires you need. B13, B14, B15, P10, & P11 can all use the same alternator. With the B15 and 2000+ P11 being the best / most powerful. B15 1.8 qg is different. To put onto sr20 Need belt 4K320 (4 rib x 32- 3/4) with no a/c . Not much room for tension but it works great. The stock S15 Silvia sidemount intercooler unit minus the inlet and outlet pipes (just the bare core) bolts straight onto the S13 and S14 factory intercooler piping, it's 2.5 litres of capacity instead of only 2 litres and has a more efficient fin design to dissipate heat. 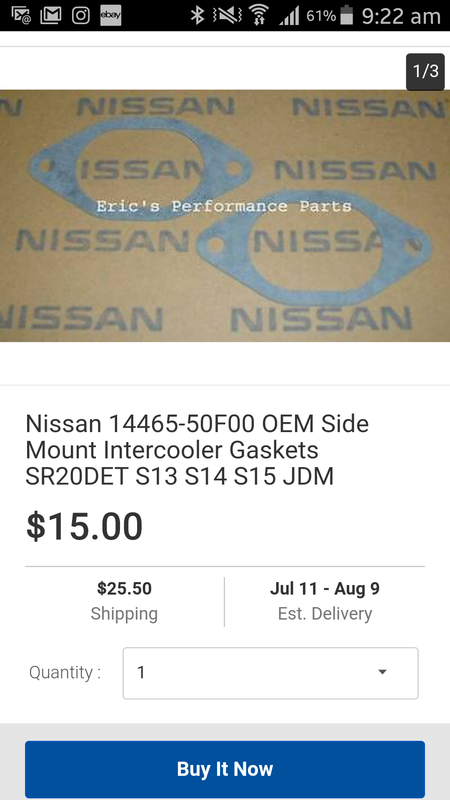 You will probably need two new gaskets for the inlet and outlet pipes for your intercooler and I have included a picture of the part number. The plastic factory S13 sidemount intercooler ducting needs the four mounting holes to be slotted slightly to make it all line up with the bumper just like oem. Hopefully someone who's on a budget sees this and finds it useful.